When we think about The Titanic Movie and Titanic songs the one that comes to mind to many of us is the Titanic soundtrack sung by Celine Dion in the 1997 film "My Heart Will Go On " and is the main theme song to the 1997 blockbuster film Titanic. With music by James Horner, lyrics by Will Jennings, and production by Simon Franglen, James Horner and Walter Afanasieff. It was recorded by Céline Dion, originally released in 1997 on the Titanic soundtrack album and Dion's album Let's Talk About Love, the song went to number 1 all over the world, including the United States, Canada, Ireland, United Kingdom and Australia. 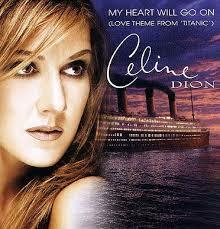 "My Heart Will Go On" is Céline Dion's biggest hit and one of the best-selling singles in history, having sold more than 15 million copies worldwide. At the height of the song's popularity, some radio stations in the US and the UK played an edited version of the song, that had dramatic moments of dialog from the Jack (played by Leonardo Di Caprio) and Rose (played by Kate Winslet) lead characters in the film inserted in between Dion's vocal lines. "My Heart Will Go On" won the 1997 Academy Award for Best Original Song. It dominated the 1999 Grammy Awards, winning Record of the Year — marking the first time to be won by a Canadian — Song of the Year, Best Female Pop Vocal Performance and Best Song Written Specifically for a Motion Picture or Television. "My Heart Will Go On" won also the Golden Globe Award for "Best Original Song – Motion Picture" in 1998. It was not so popular with Kate Winslet, who played Rose DeWitt Bukater – the notional protagonist of the song – in the film. She admits that the song makes her feel "like throwing up", due to people's tendency to start playing it when she is around: "I wish I could say, 'Oh listen, everybody! It's the Celine Dion song!' But I don't. I just have to sit there, you know, kind of straight-faced with a massive internal eye roll."